The instability in Lebanon, the IDF Chief of Staff said, was a good example of how the old order in the Middle East was being eroded. 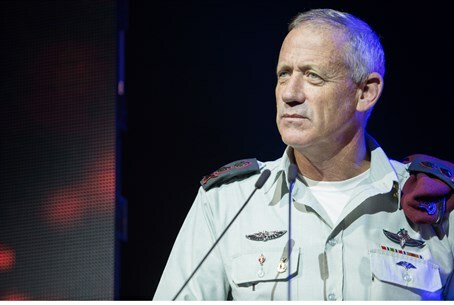 IDF Chief of Staff Benny Gantz said Sunday that Israel could “not afford” to let the northern front get too active. “We cannot allow the front to heat up too much with terror attacks launched against us,” Gantz said. The instability in Lebanon, he said, was a good example of how the old order in the Middle East was being eroded - and it is not clear what will replace it. Speaking at a memorial service for former IDF Chief of Staff Amnon Lipkin-Shahak, who passed away four years ago, Gantz said “we are currently at what could be called a historical junction. There is a wide chasm between the way the Western countries split up this region 100 years ago through various agreements – mostly for their own convenience – and the reality of today,” with the arrangements for the nation-states decided upon in previous agreements between France, Britain, and other countries falling victim to revolution in places like Syria and Libya. In addition to the military threats, Israel also had a new field of battle – the cyber field, where enemies were constantly on the attack. “Once, you knew who the players were and what their relative strengths and weaknesses were in the military sphere. Things have changed drastically,” Gantz said; just a few years ago, no one could have guessed that hackers could imperil national defense, but today “the arc of threats is very wide. While we are speaking here, hackers can destroy an Israeli bank."